TGIFMF! 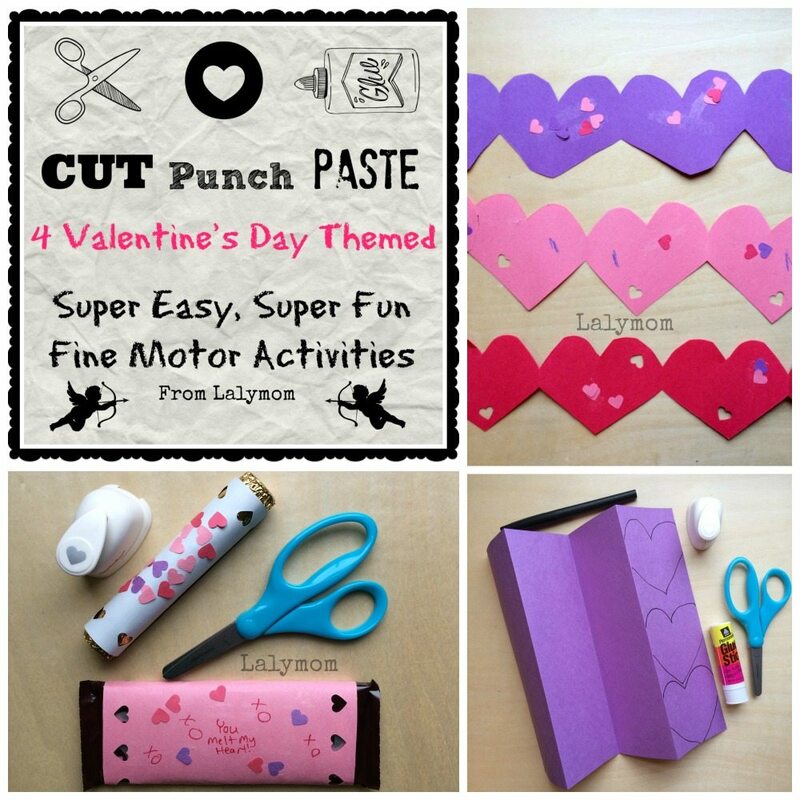 This Fine Motor Fridays post focuses on Valentine's Day Cutting Practice but you can add in paper punching, pasting and coloring depending on what you have on hand. I like to think of these as CUT-Punch-PASTE art projects, which we have done before and really enjoyed. These could be used as kid-made Valentine's Day gifts, decorations, or even a class project. As always, adapt the activity to your child's ability and be sure to supervise the activity. Since you will be there anyway, what a great excuse to craft along with your child! Prep the paper by folding it into fourths, like an accordion. Draw hearts on one exposed section, allowing the two sides of each heart to go off the edge. Invite your child to cut the lines you drew, helping if necessary. My daughter could do the straight lines at the bottom of the heart herself but asked for help holding the paper while she cut the curved parts. 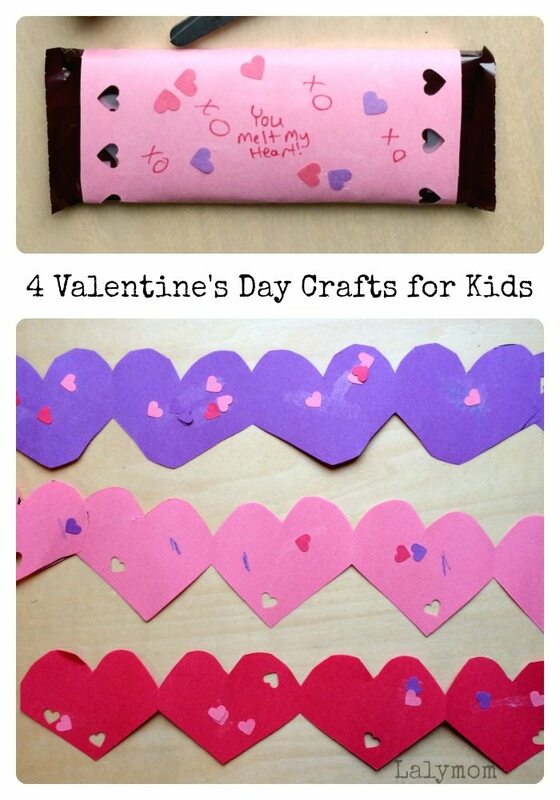 Once cut, unfold the hearts and show your child how to punch holes with the paper punch. Once you have various colors cut out and punched, you can use the small punched hearts to decorate the garland. Just glue them on using a glue stick. You can leave them in four heart segments or glue the edges together to make a longer garland. Prep the paper by drawing two straight, curved or zigzagged lines down the length of the paper (depending on your preferred crown shape). Invite your child to cut the lines. Use paper punches to punch shapes of paper to glue onto the crown or use stickers if you prefer. Crayons or markers can also be used for decoration. Once they are decorated, glue the ends of the front to the ends of the back, checking the fit, overlapping the ends to adjust. Allow for dry time before wearing! You can actually try to use the included paper wrapper for this to make it even more economical. Carefully separate the glued ends of the paper wrapper, flip it over to the white side and punch holes, decorate and glue it back onto the chocolate bar. For added scissors practice, draw lines on your construction paper based on how large of a wrapper you need. Invite the child to cut on the lines, use paper punches & glue stick, sticker and crayons to decorate it. Invite your child to glue the end of the wrapper and wrap it around the chocolate bar. Okay, this one turned out a little odd looking, I'll admit. But Ladybug enjoyed making it and wearing it and in case you see it and think of something amazing because of it…I'm including it. To make this, fold your paper in half, draw a large heart for the face (I started with one that covered the whole page but found that to be too big…half to two thirds the page is better). Add half a heart for the mouth and nose, then a whole heart touching the fold for the eyes. Invite your child to cut out the lines, punch holes for the string, tie it on and you've got a heart mask! We like our art projects around here, and I love sneaking in extra fine motor skills. If you have one that you'd like to share, please share it on the Lalymom Facebook page or email me! Thanks for coming by, Happy Valentine's Day! If you like these activities please do pin away! 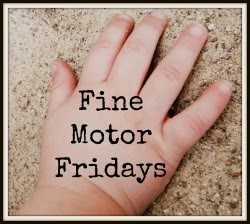 It is Friday so that means it is time again for our collaborative Fine Motor Fridays Series. We are happily growing again this week with another FMF Mama being added to the group. Please welcome Blayne from House of Burke and stick around her site to see all the awesomeness to be found there! Without further ado, here are the other fun Fine Motor Skills Activities from my Fine Motor Fridays Friends and be sure to follow all of the fun on our pinterest board! Thanks for reading my post today! If you enjoy trying simple, playful fine motor activities with your kids, check out our Fine Motor Fridays book! Awesome fun! We love punching out shapes too! I love these cut-punch-paste activities! I need to get some punches so we can try this too! They are so cute! Makes me wish we had a class to pass Valentines out to. We need to get some fun-shaped paper punches. You come up with such great ideas to do with them! How fun! Looks like your daughter had a blast! Awww, love the candy wrapper idea! Cute! I love all these fantastic ideas!